If you need a quick and easy Butter Chicken Recipe then this it. Butter Chicken recipes usually include chicken pieces marinated in a spiced yogurt for a few hours or overnight. This recipe below does not require the chicken to be marinated which is why it is quick. What I love about Butter Chicken is that you can make the sauce as hot or mild as you like. The spice mixture is usually a combination of all or some of the following spices: garam masala, ginger, garlic paste, lemon or lime, pepper, coriander, cumin, turmeric and chili. Most Butter Chicken recipes suggest serving the curry with naan, roti, parathas or steamed rice and usually garnished with white butter, fresh cream, sliced green chillies and crushed fenugreek leaves. This butter chicken recipe is quite quick because you don't have to marinate the chicken meat. There are nicer, more complicated recipes like this one but for a quick curry dish the one below is quite good. Heat the wok or pan with half the oil and cook half the chicken until brown and remove from the pan. Cook the rest of the chicken in the remaining oil then set aside. Reduce the heat, add the butter to the pan and let it melt. Add all the spices including the ginger and cook for one minute - the most wonderful aroma will fill your kitchen. Return the chicken to the pan and coat with the heated spices. Stir in the tomato puree and sugar then simmer for 15 minutes until chicken is tender and sauce has thickened. Add yoghurt, cream and lemon juice and heat through for another 5 minutes. Remove cardamon pods. 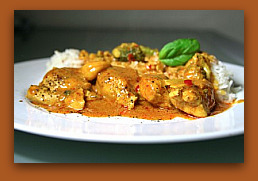 Sprinkle almonds over the butter chicken and serve with rice. See my tips for buying Chicken and cooking chicken.